As thematic investors, we look for phenomena that are transforming cash flows and profitability across multiple industries. Then, we seek to identify companies that will benefit, are investable through public equities with ample liquidity, and likely to pay off within three to five years. Here, we discuss one of these phenomena—how the next generation of automation is impacting the retail industry. More than 20 major U.S. retail chains declared bankruptcy in 2017, from Sports Authority and Toys ‘R’ Us to Payless ShoeSource. Thousands of stores closed, more than in either of the recession years of 2001 and 2008. Yet, retail sales are booming, the economy is strong and unemployment is at a low of approximately 4%. What’s going on? First, e-commerce is taking an ever increasing share of the $3 trillion in U.S. retail spending. E-commerce already accounts for more than 13% of retail spending and should more than double over the next ten years. E-commerce’s growth and increased market share occurred against a backdrop of an already bloated retail sector. Retail square footage per capita rose by more than 50% in the U.S. from 1970 to 2016. As a result, according to PricewaterhouseCoopers, there was more than five times as much retail square footage per person in the U.S. than in Europe. Brick and mortar retailers are responding by trying to move online themselves and adopting new, small-store formats to reduce costs and get closer to consumers. This is reversing the long-term trend toward big box stores. 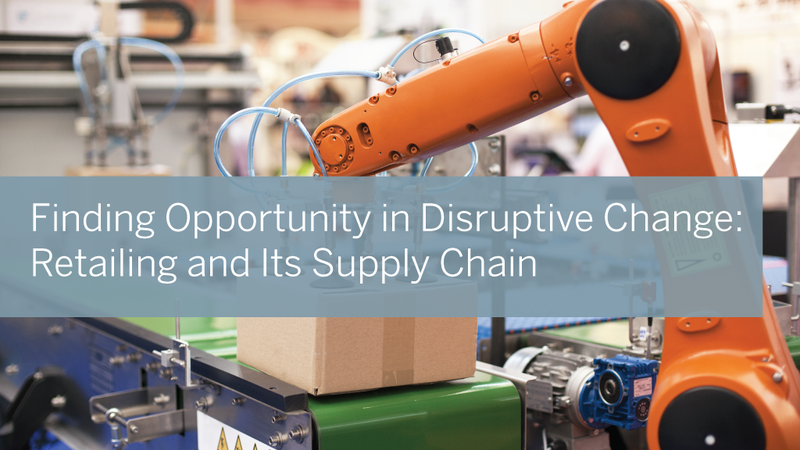 Concurrently, a new generation of automation is upending the global supply chain, rearranging the logistics of retailing and changing the cost structure throughout the supply chain. Production and fulfillment centers are moving closer to the end consumer, reversing another long-term trend toward globalization of production. Most warehouses today look much like they did 100 years ago, cavernous buildings filled with stacks of crates, shelves, pulleys and lifts. The process inside the warehouse is still largely manual. Five years ago, workers at a typical Amazon warehouse walked up to 12 miles a day, pushing a cart, locating items, taking them from shelves, and moving them to a packaging station. That’s changing. Amazon now has over 100,000 mobile robots operating inside fulfillment centers. These robots lift entire shelves and bring them to packaging stations, eliminating the need for pickers to walk the aisles locating items. Amazon’s new warehouses have miles of conveyor belts, automated shuttle systems and cameras that can read 80 barcodes per second. Robots move faster, maneuver through narrower aisles, and retrieve goods from shelving up to five times higher. These changes have resulted in a 20% reduction in operating costs. As a result, there is a growing cost and efficiency advantage of e-commerce over traditional brick-and-mortar stores. In 2012, Amazon sold seven times more merchandise per square foot of real estate than the average brick-and-mortar store. Since then, warehouse automation has boosted Amazon’s efficiency premium to nine times the average of traditional stores, which have also become more efficient but are falling farther behind. While Amazon continues to expand its robot fleet, it is also developing a next generation robot that can open boxes, identify and remove single items, and place those items in a different box. At an Amazon-hosted robotics contest in 2017, a robot that picked up a baby wipe was treated like a rock star. The celebration of this feat and the tasks being designed for the next generation of robots are examples of Moravec’s paradox. Hans Moravec, a futurist at the Robotics Institute of Carnegie Mellon University, determined that it was relatively easy for robots to be programmed to perform complex adult-like computational tasks, but much harder to replicate the simplest tasks of a toddler, like walking without falling, avoiding a misplaced piece of furniture, or placing a square peg in a square hole. This next generation of automation will use cameras, sensors and software to enable robots to perceive and respond to their environment. They will operate around the clock in a “lights out” warehouse without the need for lunch breaks, vacations, sick days, or overtime. Next-generation automation is also allowing consumer goods companies to speed time to market. Apparel companies today typically place orders as much as a year in advance—which doesn’t align well with constant demand for current fashion and customizable options. Nike says that the inability to react quickly to demand signals can result in hundreds of millions of dollars of lost profits. Today, most footwear and clothing are produced in Asia by a multitude of contractors and subcontractors. A shirt might be stitched in one factory from cloth woven, dyed, and cut in three separate factories owned by three different companies, with time between each step of production. This system evolved to cut labor costs, which in Asia can be as little as one-tenth the labor cost in the U.S. Automation makes it possible to locate production closer to the end consumer. While labor costs in developed markets are higher, the cost is more than offset by reduced transportation costs, faster time to market and the need for fewer workers. An Atlanta-based company is producing automated sewing equipment for a t-shirt factory. The company claims its first-of-a-kind technology reduces labor by 90%, while nearly doubling output per hour. Similarly, Nike and Adidas have announced plans to use 3D printing and robotics to produce footwear and apparel here in the U.S. Nike already allows shoppers to order sneakers with customized features. Amazon was recently granted a patent for equipment that uses a customer’s measurements to make personalized clothes in their fulfillment centers. To complement this strategy, it also purchased a company that makes highly accurate 3D models of each customer’s body. Executives who enjoy the convenience of being measured in their o ce for custom-made suits, typically wait weeks, if not months, for tailoring and delivery from Hong Kong. Amazon’s new system may soon provide custom-tailored suits faster. E-commerce is also gaining market share by providing next-day and same-day delivery in major metropolitan areas. To provide this convenience, Amazon, Best Buy, and other e-tailers are locating fulfillment centers closer to the customer, typically in higher-cost urban and suburban areas, rather than rural industrial parks. Amazon fulfillment centers are, on average, 60% closer to purchasers than they were a decade ago, yet still over 100 miles away. In Amazon’s top 25 markets, its fulfillment centers are almost three times closer to the end consumer than in smaller markets. Locating distribution centers 10 miles, rather than 100 miles, from consumers could reduce e-tailers’ transportation costs by 70%. We estimate that close-in fulfillment centers have the potential to reduce overall e-commerce logistics costs by another 30% over the next few years. Eventually, e-commerce delivery costs will come down even more. Ruffaello D’Andrea, the co-Founder of Kiva, estimates that it will cost twenty cents to deliver a package with a drone compared with $2 to $8 per package for human delivery today. McKinsey & Co. projects that 80% of packages will be delivered autonomously by 2025. The increased cost advantages that e-tailing, automated warehouses and last-mile fulfillment have provided to e-commerce is putting some traditional retailers out of business and reducing new store construction. Retail construction fell 20% in 2016. We expect to see a 5% to 10% net reduction in retail space over the next few years. But, in our view, it won’t spell the end of brick-and-mortar stores. People still like going to stores to see displays, discover new products, touch fabrics, try on clothes, and interact with an in-store expert. These are unique advantages that traditional retailers can build on by enhancing the shopping experience, while slashing real estate and inventory costs. To cut real estate costs, retailers are reducing or eliminating in-store inventory. We expect retailers to reduce inventory by nearly $200 billion, or up to 30%, over the next few years. One strategy is to maintain better information on inventory levels with Ultra High Frequency Radio Frequency Identification (UHF RFID) chips. Think of UHF RFID as bar codes that don’t require a carefully positioned reader. The chips send out a radio signal that informs the store’s inventory system exactly how many units of each item are on the premises. Lululemon uses UHF RFID to enable customers to see real-time inventory levels in nearby stores on a mobile app; it also uses the data to balance inventory across its store network. Levi’s tags every pair of jeans with UHF RFID so stores can nd and sell scattered units during a big sale. This reduces odd lots the store would likely sell at clearance prices. We believe these strategies can boost revenues by 5%. For a store with 10% operating margins, boosting revenue by 5% without increasing costs could increase operating pro ts by 50%. Other stores are exploring other approaches. Target has a trial store with some goods for sale, but no backroom inventory. Target treats the store like an e-commerce customer, delivering goods as needed from nearby fulfillment centers. Wal-Mart, which built its empire on a low-price, low-service model, recently paid $310 million for Bonobos, acquiring a radically different way of doing business. Bonobos calls its stores “guide shops” because a trained guide introduces shoppers to its range of products and ensures that their personal tastes are met. Its shops have no inventory on site; orders arrive at the customer’s home two days later. Similarly, Nordstrom recently introduced Nordstrom Local, just 2% the size of a typical Nordstrom, offering personal shopping guides and amenities like a nail salon, but no on-site inventory. We expect the retail store of the future to be small and uncluttered, and to offer personal shoppers, customized goods, and home delivery. Think of it as a return to bespoke neighborhood tailors—or the spread of luxury service à la Bergdorf Goodman but at much lower prices. The same next-generation automation now being used by e-tailers to put brick-and- mortar stores out of business will allow brick-and-mortar stores to reinvent themselves and provide a more desirable shopping experience. Within the theme of next generation automation, many traditional elds and old-line business models are being disrupted. New business models are being created, some existing business models are being reinvented, and others are being subjected to creative destruction. The impacts on the retail industry and its supply chain are profound and become the catalyst for even more changes. Importantly, the investment opportunities are diverse, seemingly unrelated, but connected by the threads we see in secular trends and our thematic research. Emerging markets will lose an advantage over developed markets, as low-cost wages are no longer the determining factor in location of production facilities. Automation utilizing artificial intelligence and sensors will lower prototyping and small batch production costs, facilitating mass customization. Outsourced fulfillment will allow small brands and retailers to do what they do best, create unique products and connect with their customers, leveraging third-party supply chain infrastructure. Just-in-time inventory enabled by sensors, software, and local fulfillment will reduce inventory, waste, and overhead, and the need for pro t-destroying clearance sales. Mobile and alternative payment systems will continue to gain share as consumers move away from in-store cash transactions. These trends are deflationary as production costs decline and labor and real estate are repurposed. Shoppers will make fewer trips to physical stores, but when they do go, their intent to purchase will be higher. This will increase spending per visit and reward those retailers who can satisfy visitor expectations. In sum, we’re in the early stages of a revolution in retailing that is creating compelling new investment opportunities.